It's veggie/healthy/detox week here at the Casa Moshan. We have indulged in rich food and drink for too long and need a break. So this weekend I got out my healthy cookbooks: Alice Waters' The Art of Simple Food II. 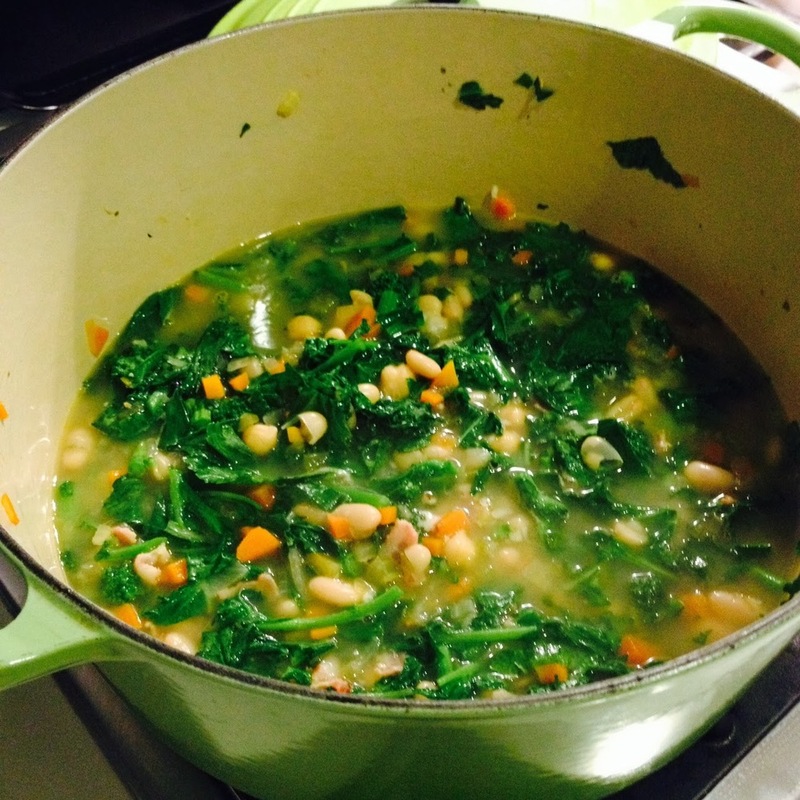 And last night, as the temperatures outside dropped to 5 degrees, I made an adapted version of her White Bean and Broccoli Rabe Soup (recipe below). A few months ago I paid $65 to see her speak about food and wound up drinking a plastic cup of water in a middle school auditorium while the speakers crackled and buzzed and I could barely hear her answers to inane questions like "How did you start cooking?" But I gotta say this soup was perfect. I altered the original a bit: bacon instead of pancetta, canned white beans instead of dried chickpeas, and simplified it (ie no fresh herbs which I never have on hand.) But it was super satisfying and a good model for hearty winter soups in general-use any beans, any greens, etc. Heat 2 tablespoons olive oil in a large pot over medium heat. Add the onion and bacon and cook for 3 minutes. Add carrots and celery and cook until soft, about 15 minutes. Turn down the heat if the vegetables start to brown too quickly. Add beans and their liquid, plus 2 cups broth and 2 cups water. Bring to a boil then simmer for 10-15 minutes. Throw in the broccoli rabe and cook for another 10 min. Taste for salt and garnish with olive oil and a squeeze of lemon.